My name is Claire Malone and I have been riding since I was 4 years old – a total of 12 years as I had a 2 year gap. I have been competing since I was 8 and have represented Gauteng at numerous SA Championships. However, this post is not about me… this post is about my wonderful Consuelo mare, Escada. Affectionately, we call her Cady and 2013 will be my third year owning her. We have competed at Junior 1.30m showjumping for the past year and this year, I aim to ride her in some 1.35 and 1.40m classes! She will be 10 this year and is 16.1hh – small considering both her parents were over 17hh! She belonged to a friend of my instructor (Claire Webb) and was in Cape Town. Being a Namibian Warmblood (and a mare), she can be extremely spooky and head strong and because of the dangerous Cape Town roads, it was decided she should be sold. My family and I bought her initially as an eventing horse because she had competed in Novice dressage with her previous owners. However, we discovered very quickly that either her dressage was FANTASTIC or TERRIBLE, depending on what kind of mood she was in… she was also not very brave in the country. When my JA horse, Pepper, suddenly died, Cady had to step up to the plate. And she really did. In 2011 Junior champs (in the 1.20ms), she qualified third highest for the championship class! 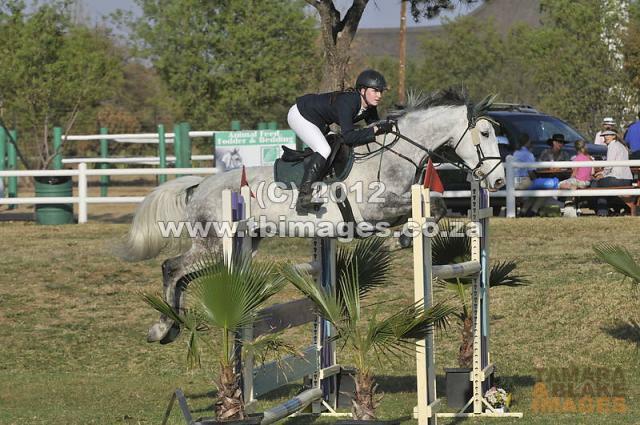 In 2012, she consistently performed in the Open equitation classes and the 1.30m classes and we were chosen to represent both teams at the Junior South African Champs held in Johannesburg. Cady is a typical girl -she has her good days and her bad days. She has whip-lash-causing mood swings and squeals if I ask for a flying change. She spooks at rocks and leaves and gates that she has seen every day for the last year. But she has a magnificent heart and she loves me dearly – and I love her! It has taken 2 years to form a good bond with her but now that it is here, it seems to be unbreakable. I’m extremely blessed to have The Herbal Horse and Pet sponsoring myself and my special horsie. Toggling between the 2 photos is not a good idea. The screen jumps up and down and it makes reading the page very difficult. Rather fix to one photo. I will fix that straight away – sorry for not replying sooner. I didn’t understand your comment until I looked at it on the sight as a viewer. Thanks!